A Kingston farm is one of five finalists that will vie for a $20,000 award Thursday during the live finale for Kitsap Bank’s Edg3 fund competition. The finale is scheduled for 5:30 p.m. Thursday at Kitsap Conference Center in Bremerton. The keynote speaker will be Combat Flip Flops CEO Matthew Griffin, a former Edg3 Fund finalist who appeared on the ABC show Shark Tank. 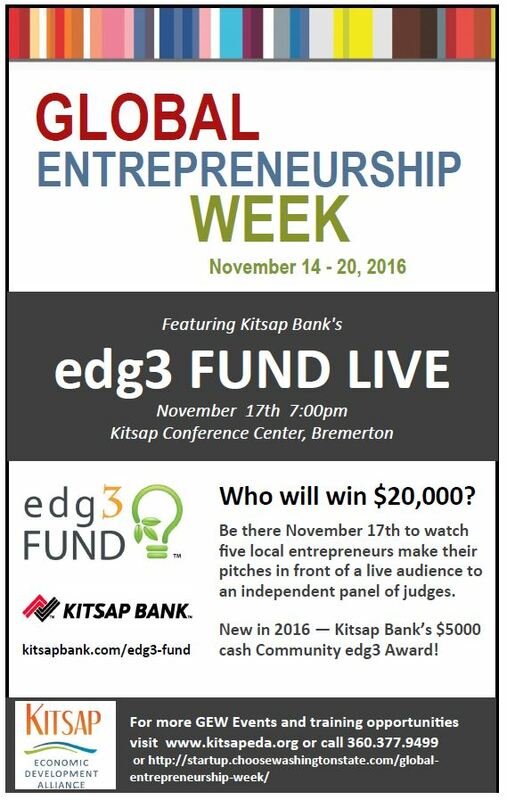 The Edg3 Fund finale is part of a slate of events marking Global Entrepreneurship Week in Kitsap. A Kingston cattle farm is the last Kitsap company left in the running for the $20,000 edg3 FUND small business prize. Silver Creek Angus was one of five finalists Kitsap Bank announced for the prize last week. The longtime family farm raises Black Angus cattle and sells beef. You can learn more about their operation in the video above. This year’s $20,000 winner will be selected by a panel of judges during a live event Nov. 17 at Kitsap Conference Center in Bremerton. Community-minded businesses aren’t always rewarded for their altruism. A competition organized by Kitsap Bank this spring aims to change that. The Port Orchard-based is offering a $20,000 prize for a small business that has a positive economic, environmental and social impact on its community. A six-week application period for the prize, called edg3 FUND, begins June 2. A public vote on social media and the bank’s website will pick a pool of finalists. The finalists will be invited to make their pitch to a panel of independent judges, who will select a winner. The competition is open to for-profit small businesses working in communities served by the bank. Find more information here.